The life and career of Terrence Alli embodies both the glory and the tragedy that often lurk not far from one another in the world of boxing. He was an exciting, eccentric and socially-conscious fighter who rose from a childhood of bitter poverty in a Third World country most ESPN viewers couldn’t place on a map, to become the world’s top super lightweight contender. And yet today, as he approaches his 57th birthday, Alli is a humble farmer back in his native Guyana with little to show for the nearly two decades in which he was an international boxing celebrity. Perhaps sadder still, by all accounts he feels he has been forsaken by the country that he always proudly represented with such patriotic vigour, even when he had to go abroad to advance his career. Terrence Alli was born on June 26, 1960 in Linden, a bauxite mining town, during the most turbulent era in Guyana’s modern history. One of fourteen children, Alli knew what it was like to go without meals when times were tough. In the early 1960s, widespread racial violence erupted between the countries black and South Asian communities, in large part fueled by a disastrous CIA intervention ostensibly designed to prevent Guyana from following Cuba on the road to communism. 1964 was the beginning of the 21-year reign of Forbes Burnham, who tried to radically transform the country through a controversial programme he called “co-operative socialism,” partially inspired by North Korea. In fact, Alli himself was a graduate of the Burnham Agricultural Institute, one of many institutions intended to forge a new economic order based on cooperatives. At the age of seventeen Alli began training at Linden’s Bauxite Bombers Gym, and within two years dominated Guyana’s amateur boxing scene, becoming the first to win both the novice, intermediate and open divisions. His first shot at the international spotlight, however – the 1978 Commonwealth Games in Edmonton, Canada – was sabotaged when the government inexplicably failed to select him. In an era where political interference touched every level of society, it was widely believed the government’s decision was prompted by Alli’s adherence to the Rastafarian faith. In the latter half of the 1970s, Rastafarianism and the dread subculture had spread from Jamaica throughout the Caribbean, and was frequently met with scorn and persecution. Guyana was no exception. Undaunted, Alli made his professional debut the following year, December 1979, at the age of 19 with a points victory over another local young fighter, Winston Goodridge. Keenly aware of the limits to how far his career could advance if confined to Guyana, he soon set off on a journey that took him first to Surinam and then Trinidad and Tobago, where he disrupted the local boxing circuit with an 8-fight winning streak over just 16 months. His eyes always on the horizon for bigger things, he put his earnings into a plane ticket to Canada, where he was nearly deported from the airport (a distant relative who was supposed to act as his sponsor never showed up). Call it luck, fate or charm, he was finally allowed entry into the country thanks to the good will of a sympathetic immigration officer. Following three Canadian bouts, Alli slipped across the Niagara Falls/Buffalo border with forged documents and headed straight to New York City, where he trained at Gleason’s Gym briefly before settling in at Times Square Gym under the tutelage of legendary coach Jimmy Glen. He would later confess that in his early days in New York his lack of funds meant he was often training on an empty stomach. For the second time in his life, Alli knew hunger. But from his new base, Alli soon became a regular contender and a fan favourite on ESPN, winning 41 of 47 fights between 1982 and 1993. By the late 1980s he was the number one ranked WBC, WBA and IBF super lightweight contender. Alli was an aggressive fighter – some said too aggressive – who could maintain an incredible level of energy and speed through ten rounds, or quickly overwhelm adversaries who couldn’t cope with his intensity. He entered the ring – at one point his entrance song was “Ain’t no stoppin’ us now” by Big Daddy Kane – as if bursting with more energy than could be contained within his small body. He was famous for sprinting from his corner the moment the bell rang (Roger Mayweather once dodged him like a Spanish bullfighter), burying opponents in a rapid flurry of punches that seemingly never let up, and chasing fighters across the ring with successive, leaping hooks. 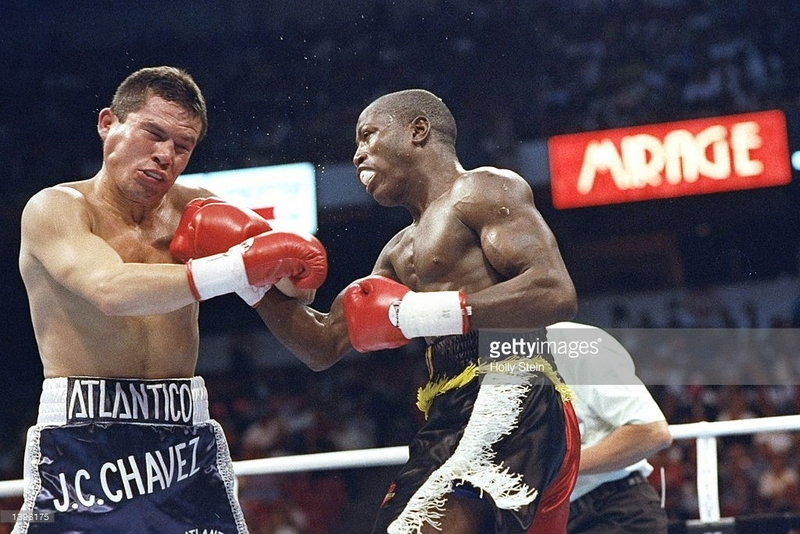 Although he lost his three world title bids – Harry Arroyo in 1985, Jose Luis Ramirez in 1987, and Julio Cesar Chavez in 1993 – when he retired in 1997, after nearly three decades in the sport, he could boast a record of 52-15-2, with 21 of those victories by knock out. Following his last professional fight in October 1997 – a loss by unanimous decision to Frank Olsen in Copenhagen – Alli returned to his native Guyana to find a country in turmoil. Serious racial violence had broken out again for the first time since the early 1960s. Moreover, despite being a regular feature on ESPN for almost two decades, Alli was soon financially destitute. When the local press caught up with him he was renting a small, rat-infested house for the equivalent of $50 USD a month in the village of Mocha-Arcadia. He claimed to have invested what savings he had in a truck, portable sound-system and hair salon, only to be ripped off by his would-be business partners. He told local reporters that the New York accountant who handled his finances while he was focused on his boxing career had in fact been stealing his money and not filing taxes – leaving him both without the full extent of his earnings and in serious trouble with the IRS. His common-law wife, who had been with him since he was 15 years old, refused to return with him to Guyana, remaining in Miami with their four children. More recently, Guyanese journalist Michael Benjamin caught up with Alli, and found him living in the village of Catherine, Mahaicony, where he was leading the humble life of a subsistence farmer. Aware that many people assume he blew his boxing fortunes on a short-sighted life of excess as many professional fighters have, he made some startling claims about the financial realities of his boxing career. His purse on those ESPN fights was rarely above $7,500 USD, he claimed, and even his title fights with Arroyo and Ramirez earned him surprisingly small payouts. Moreover, despite what people often assumed, he was never a baller or a womanizer. “I have never drunk a beer in my life, I never did drugs, I never partied,” he told Guyanese journalist William Walker in 2005. This writer has nothing new to say about the dark side of the boxing industry, nor do I care to speculate on how much of Alli’s financial straits have been of his own making, versus the greed and deceit of others. I’d rather end on a positive note, by reflecting on some of the other things that made Terrence Alli such a special fighter, in addition to his phenomenal physical talent, and the hardships he overcame on his path to greatness. In his heyday, Guyanese fans from New York used to follow him around the country. It was a loyalty he earned because, despite having relocated to the United States to further his career, he entered each fight draped in the Guyanese flag and shouted out his people and homeland after each fight. Then there was his unmistakable eccentricity – he was prone to “winin’ ‘e waist” (dancing, Guyanese style) between rounds; for a phase he fought in different coloured boxing shoes adorned with bright tassels; and he performed a trademark backflip after each victory (sometimes three, if the moment moved him). One can only imagine what Julio Cesar Chavez thought in May of 1993, when Alli entered the ring in an over-sized Mexican sombrero fashioned in the colours of the Guyanese flag. But it wasn’t all comic relief. In his legendary 1984 title bout against Harry Arroyo, with the horrific Ethiopian Famine in the headlines, Alli dedicated his fight to the people of Ethiopia. The ongoing tragedy in the Horn of Africa struck a deep chord with Alli – he knew what hunger was.